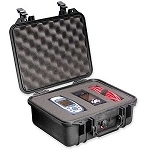 The versatile Pelican 1550 Protector Case offers total protection for your equipment. Because it is made of Ultra High Impact structural copolymer, it is extremely strong and durable making it appropriate for rugged equipment and storage. The neoprene o-ring and ABS latches seal perfectly and include an automatic purge valve for quick equalization after changes in atmospheric pressure. 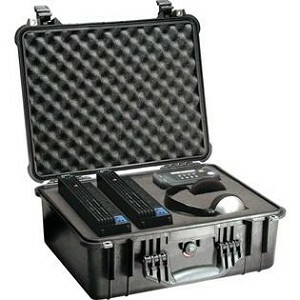 The high density foam of this case provides total protection against impact, vibration or shock for your equipment. It also uses stainless steel hardware and has padlock protectors to provide extra security and strength against cutting and theft. It is carried by a comfortable rubber over-molded top and side handles, retractable pull extension handle and built-in wheels. The Pelican 1550 is also available in an EMS case style which includes specifically designed storage organizers for EMS personnel. The 1550 meets Air Transport Association standards for transit cases, is NATO-codified, and is tested to MIL C-4150J and IP-67 rating for temporary submersion. 20.62" x 16.87" x 8.12"
18.43" x 14.00" x 7.62"